The default view in the Gradebook is to view all students at a time, but you can also view students individually in the Gradebook Individual View. However, Individual View currently does not support settings and options from the New Gradebook. 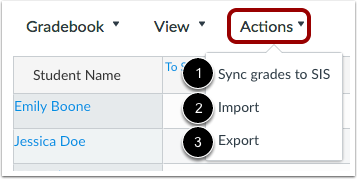 The Actions menu allows you to sync grades to your institution's student information system (SIS), if applicable. By default, your course shows all active students. In the Search field, you can search for an individual student by name or by SIS ID. 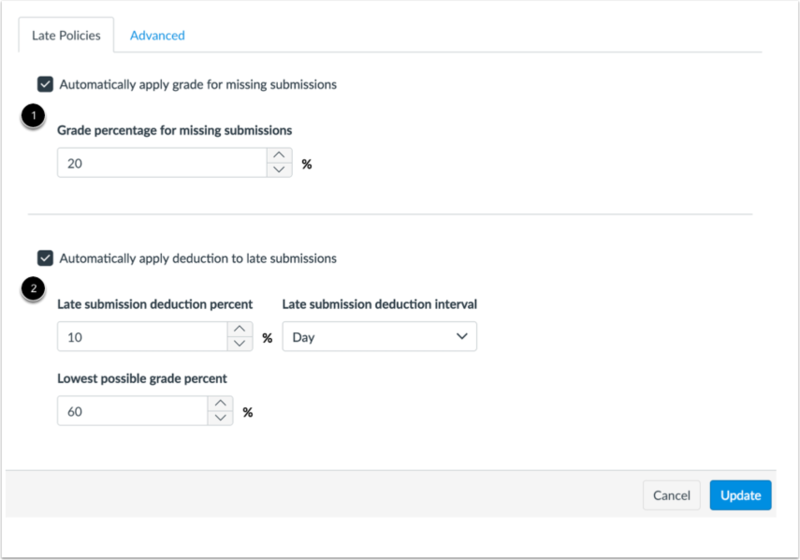 The Gradebook Settings allow you to apply Late Policies or a Final Grade Override in your course. The Late Policies tab allows you to apply late policies in your course. 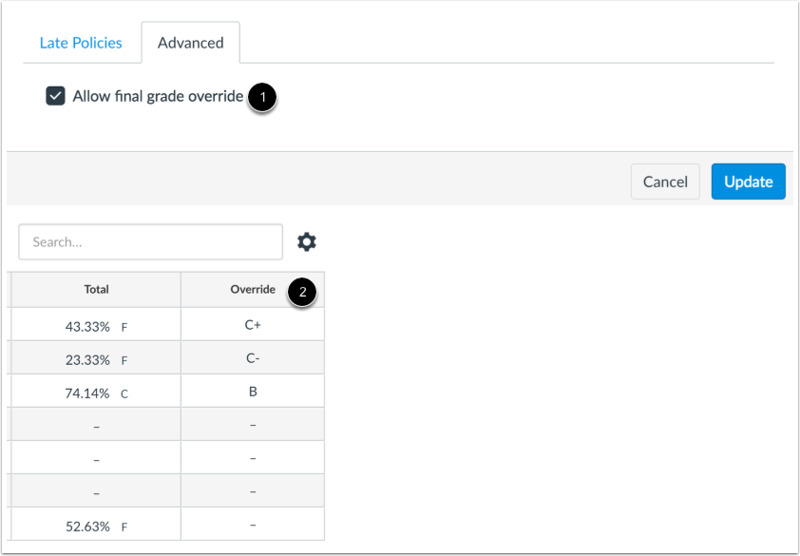 The Advanced tab allows you to apply a Final Grade Override in your course . If enabled, you can enter an override grade for a student that is different from the grade automatically calculated by Canvas . To view a student's Grades page, click the student's name . If you have enabled Student View in Course Settings, the Test Student is shown at the end of the Gradebook and is automatically added to every section in your course. Test Student data does not factor into course analytics. If you want to remove the test student completely, you must remove the test student from your section enrollments in Course Settings. Each column in the Gradebook represents a published assignment in the Assignments page. Each column displays the assignment title, total points, and each student's grade. To view the assignment, click the name of the assignment . Icons and colors represent assignments and submission statuses within Canvas, including differentiated assignments, grading periods, and MasteryPaths. You can manually add a column as part of importing grades to the Gradebook. However, assignments imported in the CSV file are automatically published. You can also create non-submission or on-paper assignments to add to the Gradebook for manual grading. 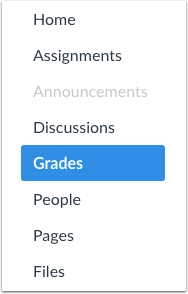 You can also enter grades and change the submission status by clicking the Grade Detail Tray icon . 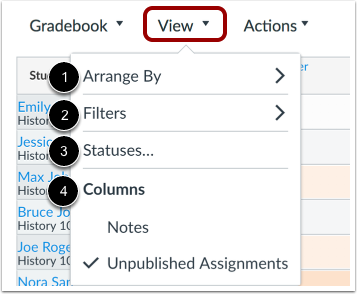 The Grade Detail Tray allows you to enter or edit grades , change the status of a submission , and leave comments for the student . The assignment groups shown in the Gradebook match the assignment groups created in the Assignments page . If your assignment groups are weighted, the weighted grade displays below the group title . Assignment group weights are reflected in the total grade. The assignment grade earned by the students is multiplied by the assignment group weight. Grade totals from assignment groups are calculated in the Total column of the Gradebook . 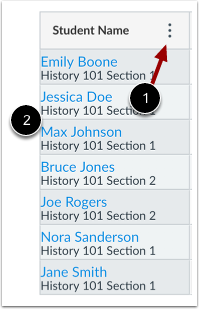 You can hover over the column header to view the Total column menu , which allows you to sort by grade and move the total column to the front of the Gradebook. Additionally, if your assignment groups are not weighted, you can view the totals as a point value instead of a percentage. Previous Topic:How do I get to SpeedGrader from the Gradebook? Next Topic:How do I arrange columns in the New Gradebook? Table of Contents > New Gradebook > How do I use the New Gradebook?